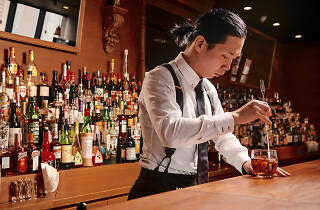 New sky-high Japanese cocktail hotspot Bar De Luxe comes courtesy of legendary bartender Hidetsugu Ueno, the man behind Tokyo’s famous Bar High Five, a venue that’s consistently rated among the world’s best. 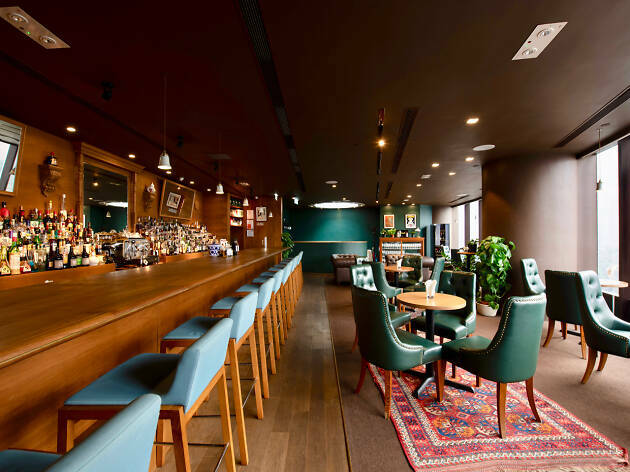 This Hong Kong outpost is helmed by the icon’s protégé, Yuriko Naganuma, who mastered her craft under Ueno and another of Japan’s most decorated bartenders, Takao Mori. The bar is part of Attire House, which touts itself as a gentlemen’s haven that also provides tailoring and grooming services. And in the watering hole, the teal walls and magnificent bar, which is carved from Japanese walnut, scream opulence. Floor-to-ceiling windows open up to a fab view of Central’s apartment blocks too. There’s a lack of ambient lighting and music, which isn’t ideal but this experience, at least, is in keeping with quality Japanese cocktail venues of the same ilk. by the caramel notes of the Averna Amaro, making for a smooth, incredible sip. We also try The Plum Beauty ($168). It mixes Kirin Fuji Sanroku whisky, plum and ginger wine and cinnamon liqueur. The cinnamon is pleasant on the nose and the sharp plum kicks back delightfully. A masterclass in mixology. Plus, it pairs well with the lomo and foie gras ($168), as the fat from the foie mellows the sour plum notes. 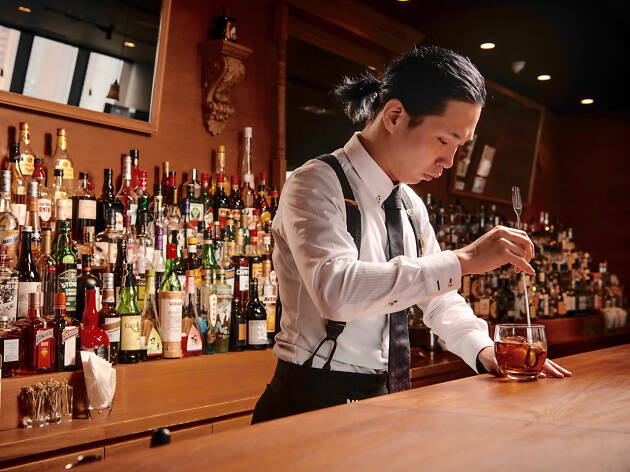 We may not be gentlemen (the hint’s in the byline) but there’s no doubt that Bar De Luxe is a haven for expertly crafted cocktails. Could it be as good as Bar High Five? On this evidence, we bet our bottom yen it could.